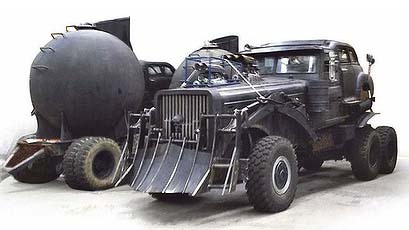 Here’s a picture of the vehicles from the shortly to be filmed Mad Max Fury Road movie. Hopefully these are the smokers driven by the bad guys and Max is in his Jensen Interceptor again! Brutal. Or is that my Skoda? Crikes, who’d be seen driving around post-apocalypse in a Skoda? The V8 Interceptor is an XB GT Ford Falcon, not a Jensen. Just wanted to ratified that Mad Max car is a FORD FALCON COUPE, the Jensen interceptor isn’t in the film. Thanks for the pics. Hey, I drive a Skoda, what do I know about cars!